After the suicide of a mutual friend, a group of people, once college friends gather for his funeral and to reconnect with themselves through their shared friendship. Shot in sequence by an ensemble cast, The Big Chill is the little film that could. 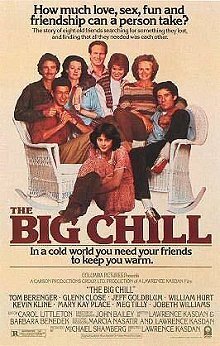 Without action scenes and huge special effects, The Big Chill tells over one weekend the story of the friendship of a lifetime. Thirty-something and sucessful, this group realise that their lives have become something quite different from what they envisaged. Instead of saving the world they have summer houses and big deals. Who ever thought we'd both make so much bread, two revolutionaries. The Big Chill is presented with deceptive simplicity. A lonely waterside mansion in America's south is the setting for a celebration of life. So many films overload themselves with intentions of great worth. When friends get together and talk and eat and play together there are moments of great truth. Sometimes those that we have the most in common with have ideas and make choices that send a big chill down our spine. Great music, great food, and great friends. Grab a pizza or make some spaghetti (remember to throw a piece to the ceiling to test it! ), curl up in front of the screen with a tub of ice-cream and join the fun. The meal is ready, let's go!